Wooden Henry Avery's Fancy Black Sails Limited Model Pirate Ship 26"
Caribbean Pirate Ship Model Limited 15"
Wooden Black Barts Royal Fortune White Sails Model Pirate Ship 7"
Wooden Fearless Black Sails Pirate Ship Model 20"
Wooden Caribbean Pirate Ship Model 4"
Search for lost treasure as you set sail for adventure on the high seas aboard this scale tall model ship replica of Henry Avery's Fancy Pirate Ship. This exquisitely constructed sailing ship is highlighted by fine craftsmanship and attention to detail. 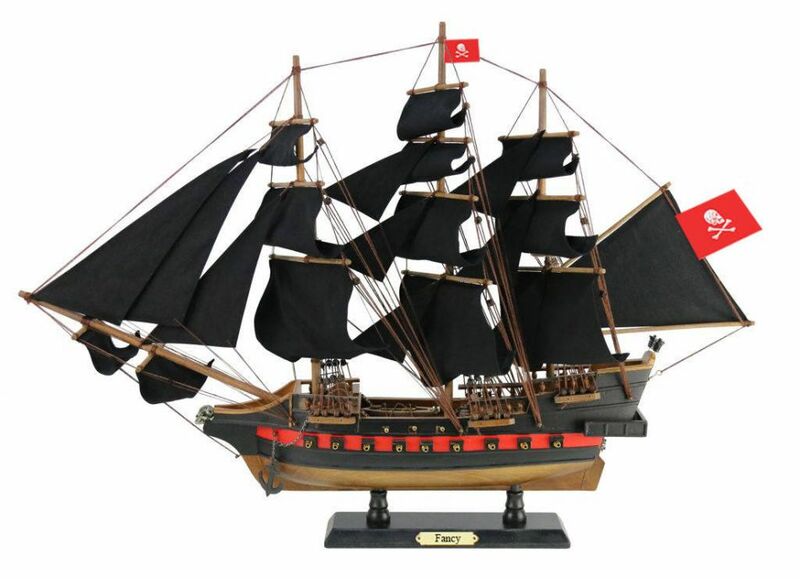 This Fancy pirate ship model proudly displays its exquisitely-crafted features whether seated upon a shelf, desk, or table, and bring an indomitable spirit of adventure to any room or office. The Fancy was initially a 46-gun privateer named Charles II - after Charles II of Spain - in Spanish service, commanded by a Captain Gibson, and was anchored at A Coruña, Spain. 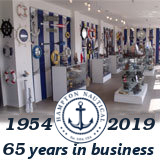 On May the 7th, 1694, Henry Avery and a few other conspirators organised and carried out a successful mutiny and, setting Captain Gibson ashore, left A Caruña for the Cape of Good Hope. At this time the Charles II was renamed Fancy. Upon arriving at the Cape, Every sailed to the island of Johanna (Anjouan) in the Comoros Islands, where he had the Fancy careened - removing barnacles and weed from the section of the hull that was permanently below water, increasing her speed. He also had the Fancy razeed, intentionally removing parts of the ship's superstructure in order to increase her speed. Following this work, the Fancy became one of the fastest ships active in the Indian Ocean, and Every used this speed to attack and take a French pirate ship, looting the vessel and recruiting approximately 40 of the crew to his own ship, leaving him with a total complement of around 150. Every continued to be active in the Indian Ocean where he worked alongside other famous pirates of his time, including Thomas Tew. Most notable in his captures was the Ganj-I-Sawai, a ship under the command of Aurangzeb. Mounting 62-cannons and four to five hundred musket-armed guards, cannon fire from the Fancy was instrumental in Every's victory - the first salvo caused a cannon to explode, and a number of gunners were killed. Every's career ended when the crew returned to Nassau, in the Bahamas, where Every returned to Britain aboard the sloop Isaac. Although the fate of the Fancy is unknown, it was rumored that Every gave her to governor of Nassau as bribe.